Users who like Karen Kerrigan, President/CEO of SBE Council (SBECouncil.org), praises both outgoing SBA Administrator Linda McMahon and nominee US Treasurer Jovita Carranza, and talks about how the backlog of President Trump's appointments has impacted small businesses. Users who reposted Karen Kerrigan, President/CEO of SBE Council (SBECouncil.org), praises both outgoing SBA Administrator Linda McMahon and nominee US Treasurer Jovita Carranza, and talks about how the backlog of President Trump's appointments has impacted small businesses. Playlists containing Karen Kerrigan, President/CEO of SBE Council (SBECouncil.org), praises both outgoing SBA Administrator Linda McMahon and nominee US Treasurer Jovita Carranza, and talks about how the backlog of President Trump's appointments has impacted small businesses. 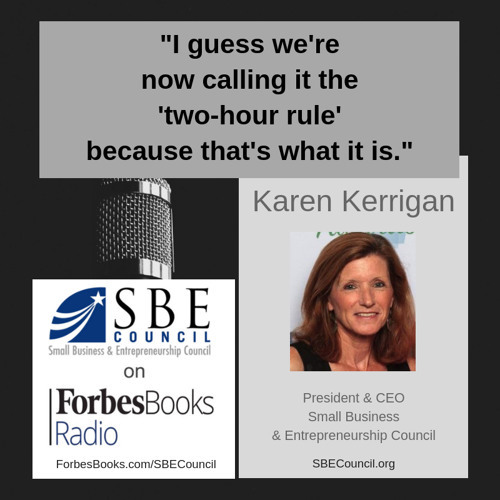 More tracks like Karen Kerrigan, President/CEO of SBE Council (SBECouncil.org), praises both outgoing SBA Administrator Linda McMahon and nominee US Treasurer Jovita Carranza, and talks about how the backlog of President Trump's appointments has impacted small businesses.